A lead magnet is an offer like a content piece, free consultation, or other experience valuable enough that prospects will share their email addresses to receive it. Lead magnets help your prospective customers solve the problem that brought them to your business while helping you follow up with prospects and earn their business. Standing out from your competitors can be a real challenge. Amidst all the noise, how do you create an unforgettable first impression for your potential customer? The answer can be a high-quality lead magnet. 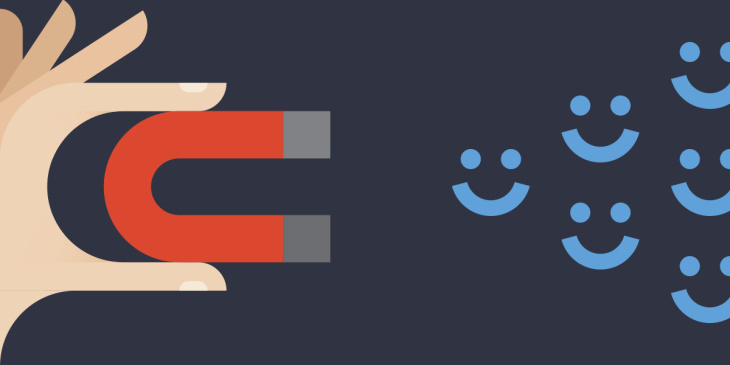 In this guide, we’ll take a look at the process of creating a lead magnet. We’ll then share a variety of resources for lead magnet creation with examples of ones that are well done. Finally, we’ll explore creative ideas on how to market that lead magnet on Facebook and actually attract the leads you want. 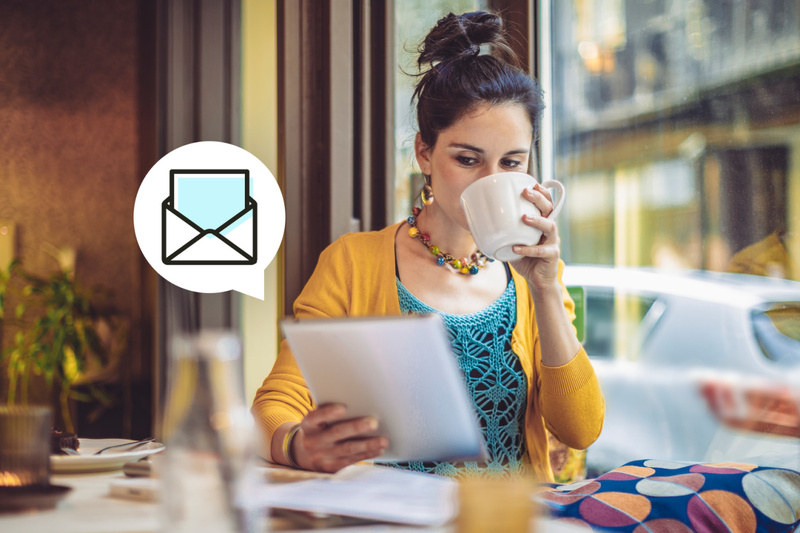 This is a great way to build your email list with the knowledge that email subscribers equals potential profit. Ebook: An e-book for business is a little like a white paper but tends to address broader topics in a bit more entertaining way. They should be authoritative, but not too technical so that they come off as accessible to a broader audience. Infographic: If a picture is worth a thousand words, an infographic takes that notion 10 times. By integrating beautiful graphic design and information, such as statistics or related facts, you can create a whole story in a single image. Slideshow: Slideshows can be the best way to walk through an idea, highlighting key insights, and visualize concepts. Slideshows make great follow-up calls-to-action, as well. The slideshow you developed for sales can work well as a follow-up to a less sales-oriented piece, like an e-book. This way, you can move your prospect closer to a sale. Quizzes: People generally love quizzes and surveys, and they can make great lead magnets. Whether you decide to go for something fun or more focused on informing, you can use apps like qzzr.com or dilogr.com to build your product and then embed the quiz on your site pages or emails. If none of the above resonates with you, or you don’t have much content already developed, a brainstorming session can be useful for organizing your thoughts. Your lead magnet that will encourage your target audience to share their information has to be specific to your business. Brainstorm these ideas by creating a worksheet or spreadsheet and list common situations that your target market faces on a daily, weekly and even a monthly basis on the left side. On the right, list three to five high level steps someone would need to take to get their desired end result. Set a 15-minute timer and dedicate the entire 15 minutes to listing out and brainstorming situations that your target market needs help with. You may surprise yourself with how many lead magnets you come up with in a short amount of time. Then take those ideas and use another 15-minute brainstorm to focus on each lead magnet idea and list out the high-level steps required to help someone get the result you promise them. Choose a lead magnet idea from your list and create an outline of what you want your lead magnet to look like. Once the outline is complete, it’s time to write your content. Some may find it easier to record audio talking about each bullet point, rather than sitting down and writing. If so, QuickTime or Audacity are good tools. Once you finish your recording session, save it and either transcribe it yourself or send your audio file to a transcription service. If you go from voice to text, it will require a good amount of editing so keep that in mind. Once the content is ready, creating a professional and attractive design for your lead magnets is the next step. Fiverr.com has affordable design covers, in which you can search for e-book cover designs in a variety of categories. With a blank first page, add your cover design to the document by going to Insert > Photo > Picture from File. In order to save the Word doc as a PDF, go to File > Save As and select save as a PDF. And there you have it! Your very own lead magnet in just four simple steps. These eight tools can help you create a lead magnet— and they won’t cost you anything. One of the most simple graphic design tools out there - so simple in fact that the company estimates learning time at 23 seconds. 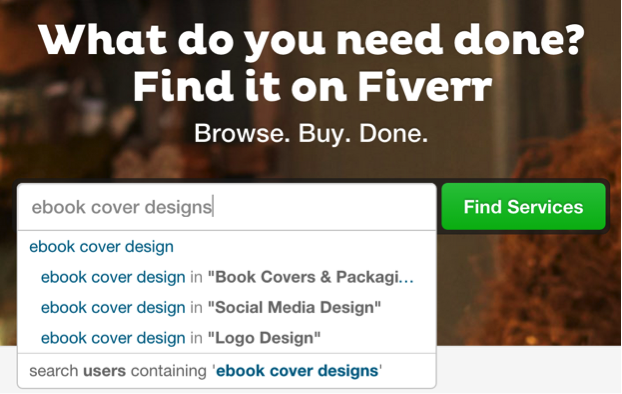 Try Canva to design a lead magnet like an e-book, infographic, checklist, or cheat sheet. Let’s face it, many of the stock photos out there are absolutely terrible. Case in point: women laughing alone with a salad. Luckily, TheStocks.im provides high-quality, royalty-free photos from 19 different providers. Start here for images to accompany your lead magnet content. Piktochart offers more than 400 free templates (plus more paid options) that help you turn your statistics into a work of art. Input numbers into spreadsheets linked to the designs, then customize your work with your choice of fonts, colors, images, and icons. In order to convert your lead magnet into PDF, no Adobe skills are required with Smallpdf, a site that turns file types like Word documents, PowerPoint presentations, images, and Excel spreadsheets into PDFs—and vice versa. A live demo or consultation can serve as a lead magnet when you capture contact information before providing the service. If the conversation is taking place online, use Join.me to share your screen with up to 10 participants. Webinars are the way to share tutorials, presentations, and expert interviews with an audience anywhere in the world. FreeConferenceCall.com allows for screen sharing and video conferencing with up to 1,000 participants, and more with paid options. Some lead magnets offer a free gift or sample in exchange for an email address. Gleam helps with that process and collects contest entries by asking entrants to take actions like following social media accounts or watching videos. Paid versions allow you to capture entrants’ email addresses and sync them to email providers like Keap. Over the years, different marketers have implemented varying lead magnet strategies. To help inspire your lead magnets, here are a couple marketers who have nailed their lead magnets so you can replicate some of those same strategies to start seeing your own numbers grow. The lead magnet itself is cleverly written. He confirms the importance of this online course with a price. The message is clear: You are getting something that's worth $300 for free if you sign up right now. But how can you develop your own course? First, see what has proven interest. Take a look back at your own previous posts. More often than not, there are one or two posts in particular that have done exceptionally well. Therein may lay the answer to your course subject matter. Once you have determined the subject matter of your course, you can then create the course itself. If you are a beginner in course creation, stick to the basics. Throughout the conception of your online course, it is important to keep in mind that the most important thing is the content. You can and should make your PowerPoint as visually appealing as your abilities allow, but great content > great visual. The pop-up that appears on screen must strategically be closed before readers can view his site, thus all but forcing potential subscribers to at least glance at it on their journey to Bullas’ blog. The lead magnet itself is actually quite similar to Patel’s. 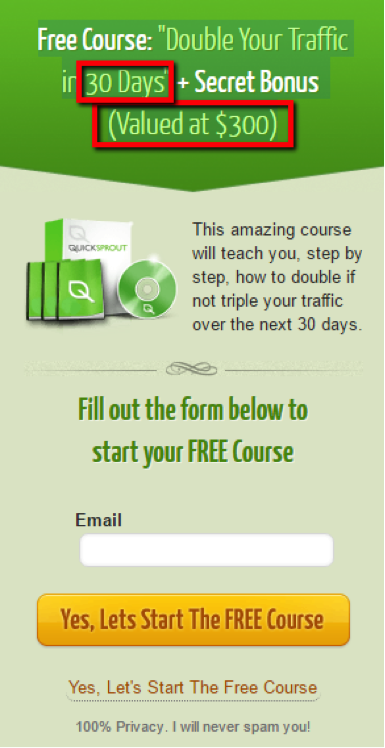 Although he is offering an e-book as opposed to an online course, both intrigue readers with their wording. 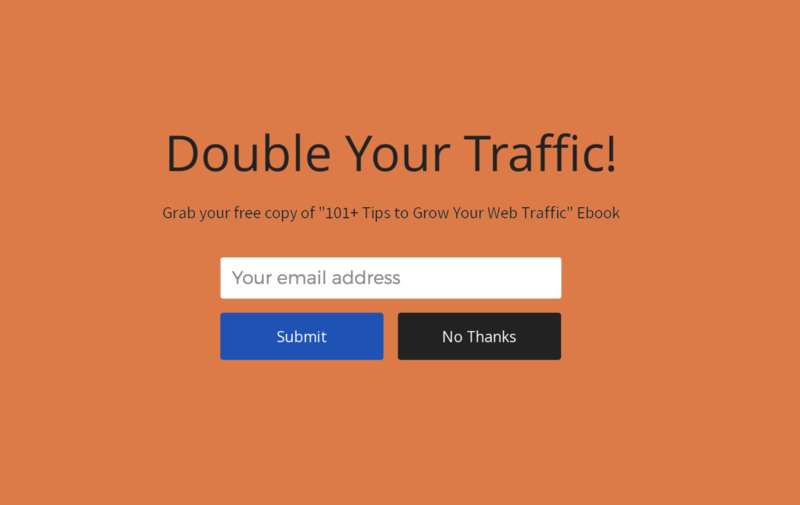 In large letters at the very top of the lead magnet, Bullas promises to double your traffic. Keeping the form short and simple also increases the chances that visitors will enter their email. As for the content of the e-book, you need to find a previous post on your blog that not only has done well in social shares/comments/etc. but one that can also be elaborated upon for an entire Ebook. Be sure you can able to discuss your topic in great detail. For more on the creation details, read Michael Hyatt’s How to Create and Ebook in 7 Easy Steps. Now that you have an exemplary lead magnet, how do you get it out there? How will people find your lead magnet? You should be micro-targeting for each ideal customer demographics and psychographics. Your prospects will then know that you understand them and that you speak their language. You know their problems, and you know what their solution is. Trust is built when they feel connected to you and your business. To catch attention, you need something highly consumable. Checklists, case studies, guides, and tools all perform well on Facebook. By adding time sensitivity to the post and letting the user know that there is a looming deadline, they will feel the urgency to act and get the lead magnet. We share that which we feel is valuable. What is valuable? That which is personalized to us and that we can get immediate benefit from. Share your content with "lookalike audiences.” If we have an awesome lead magnet for the pianist's, we want someone to take our post and drop it in a Facebook group for pianists. The more specific you are in your targeting and the alignment of the message, the more likely that the sharing will be strategic. 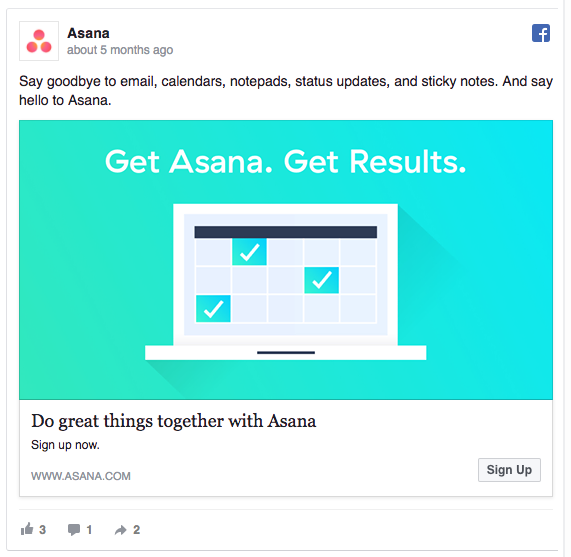 Here are several examples of quality Facebook Ads examples that have nailed the lead capturing best practices. 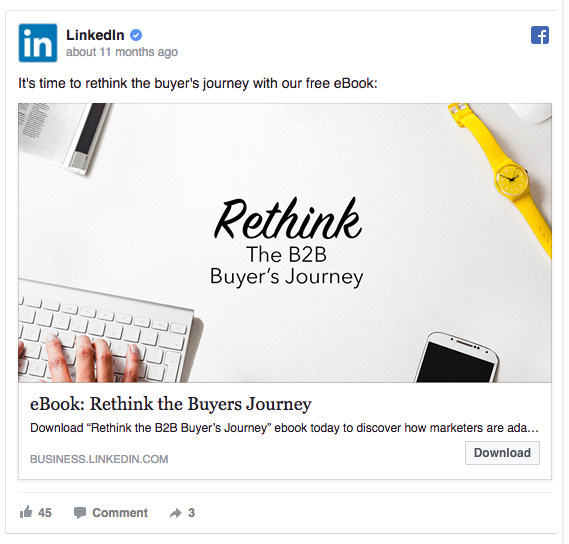 LinkedIn’s Ad promotes a free guide to rethinking the B2B buyer’s journey. Notice the “Download” button in the right corner of the ad–if a prospect’s interested in the guide, they can download it without leaving Facebook (that’s a Facebook Lead Ad). LinkedIn’s ad mentions the fact that they’re giving the e-book away for free. After they’ve caught people’s attention with an irresistible value offer, they offer a brief explanation how the guide will help the reader. When creating lead magnet ads to capture your prospects’ contact information, ensure that your offer is highly relevant. People are interested in high-quality content that helps them to achieve more. 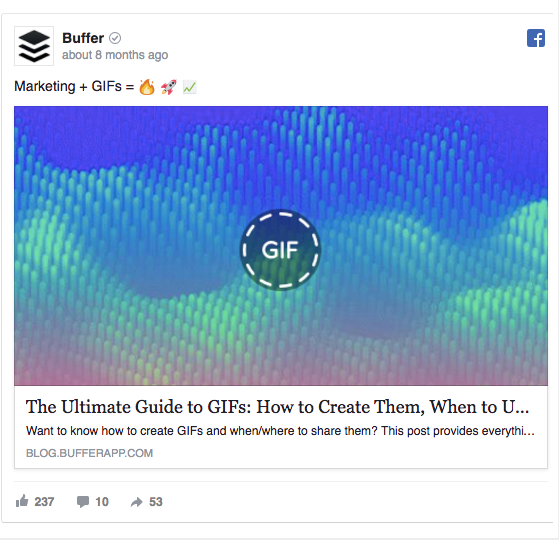 Buffer’s Facebook ad offers a guide as well. But the ad type they’re using isn’t a Facebook Lead Ad. It’s a regular Facebook ad campaign that can be set up in a few minutes. As people click on Buffer’s Facebook ad, they’ll be conducted to a landing page where they can download the guide. 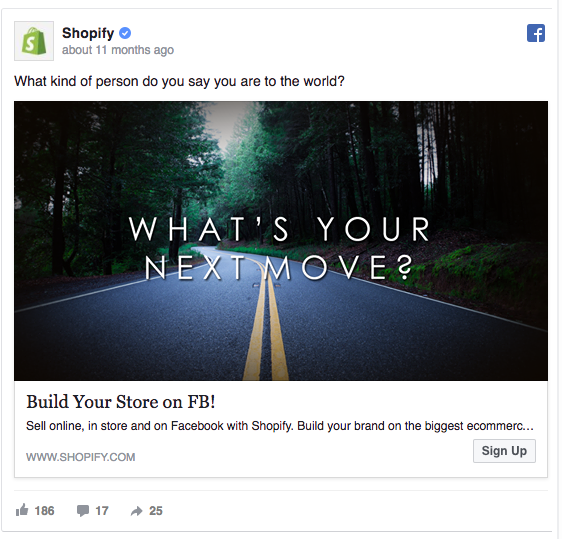 Shopify’s ad uses the call-to-action “Sign Up” to only attract leads interested in signing up. While using the “Sign Up” CTA may scare away some people, the people who do click are more likely to become a customer. Using Facebook Ads to promote your lead magnets is a great tactic for amplifying your brand’s reach, growing your website traffic, and entering more prospects into your sales funnel. If you’re struggling to collect leads with your lead magnet, the problem can likely be summarized one of two ways: People aren’t seeing it, or people aren’t downloading it. You have a traffic problem or a conversion problem (or perhaps both). To spread the word, link to the landing page from other pages within your website, post it in forums and on message boards and work on your search engine optimization to help people discover the landing page organically. Another option is working with social media advertising. For help getting started, check out this guide, The Art of Social Media Advertising. If you increase the traffic to your lead magnet and still don’t get many downloads, you know that conversion is more of the problem. A lead magnet is only worth the download if it solves a specific problem for a specific audience. Like a real magnet, a lead magnet should repel some people and attract others—the type of customers you want to serve in your business. If your topic returns 85 million results on Google, prospects don’t necessarily need to give away an email address to get the information they’re seeking. If your lead magnet topic is proving to be too competitive, consider turning the lead magnet (or a considerable portion of it) into a blog post. The landing page for your lead magnet should clearly explain what prospects will gain from the download. Instead of a general invitation, you must tell visitors exactly what they’re going to learn. The benefits can’t be made too obvious. To explain them further, consider including screenshots from the lead magnet or answers to frequently-asked questions on the landing page. With a lead capture form, assume that your prospect is in a hurry and that she’s sharing your email address reluctantly. The more form fields, the lower the conversion rate, according to an analysis by Oracle Marketing Cloud. If you need or want more information from your prospect, you can always try asking for it later. A multi-step lead capture form allows you to capture the essential information first before asking for optional fields on the next screen. You don’t want to attract visitors for a specific purpose only to distract them from it. The landing page for your lead magnet should have one goal: getting people to download the lead magnet. That means it should have only one call-to-action. Ask for too much, and you might get no action at all. If it looks messy on a mobile device—or worse, doesn’t function correctly—it’s practically destined for a low conversion rate. Mobile-friendly websites are no longer a nice-to-have but a necessity. Check your landing page from a phone and tablet to ensure the images and copy display properly and that the form fields can be easily completed and submitted. Finally, if your lead magnet is a PDF that would be difficult to navigate on a phone, send it via email instead of displaying it on a web browser so the prospect has the option to read or revisit it later. The landing page for your lead magnet should provide a seamless transition from the visitor’s entry point, whether it be a Facebook ad or a Google search result. A mismatch in the landing page’s title, copy, or imagery could create just enough hesitation and confusion to prevent the visitor from proceeding with the download. With the right lead magnet, you are empowered to attract all the ideal customers as you can handle. You can only make a first impression once and you want your first impression to seal the deal and leave visitors wanting more. Interested in Keap? Check out Keap pricing or start a free trial now.